Arches and Towers and Rivers – oh my! 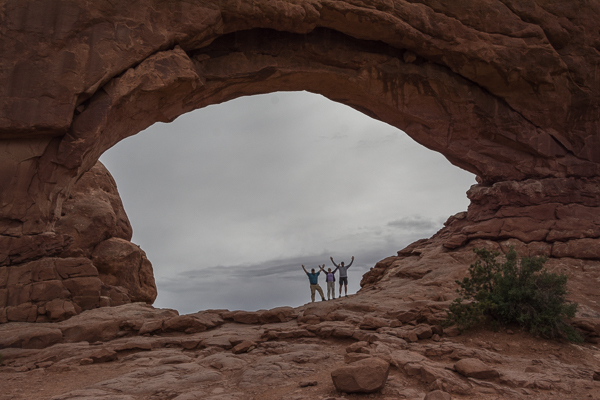 On the first day of their visit we attempt to share Arches National Park with Sheila and Weldon. To avoid the crowds that we normally see snaking slowly through the entry gate here, we make Sheila and Weldon rise early and hit the road before 8am for the 1 mile ride to the park. Current all night road construction inside the park so severely limits the operating hours of this popular tourist attraction that the overflow traffic spills out onto the highway by 9am. Slowly we make our way to the gate to find it unattended. “Why is no one collecting the entry fee?” we should have asked ourselves, but we innocently proceed on. 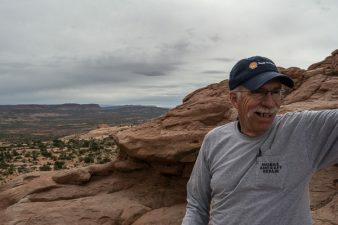 We stop at the balancing rock, the Windows and the viewpoint for Delicate Arch with little opposition. I can hardly wait to reach Devil’s Garden as I have been planning a short hike here with my sister for weeks. Instead of sliding into a spot in the parking lot at Devil’s Garden, a maze of cones and barricades funnels us into a traffic jam just short of Sandstone Arch. 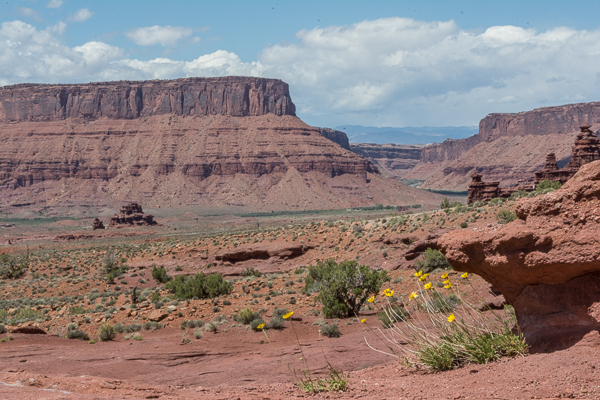 At this mandatory U-turn back toward the park entrance, we learn that Devil’s Garden has just been closed to the public until June 3 for its own refurbishment. Robbed of our chance to hike here and tired of the dreary, rain threatening skies over the park, we follow the receding headlights out to the highway. Selecting a direction that appears to be cloud-free we settle down for lunch at a riverside table in Rotary Park. 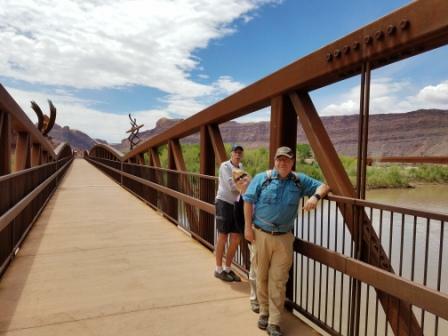 As we walk the bike trail that borders this park we decide to find Fisher Towers in hopes that we can hike there. The Fisher Trail head just off Hwy 128 is easy to find, but the trail itself descends at a pretty negative angle for as far as we can see. After a short foray down the trail toward the Tower bases, we become discouraged by the warm temps and the unavoidable uphill return so we turn around and head for the top while we still can. I jump behind the wheel of the Jeep and point us toward nearby Onion Creek Road which is without doubt one of the most colorful scenic drives in this area and one of my favorites! It is a 2 way road, but we were going very slowly. I just sped up the video to make it shorter plus it looks so much more exciting that way! I am glad you enjoy the videos and am so glad to hear from you. Have a wonderful summer! Say hi to everyone at the gym for me!